A sketch of the new Hyundai Azera. CHICAGO -- Hyundai Motor America expects the redesigned Azera to attract Sonata owners, as well as buyers of other brands who want a premium front-drive luxury sedan. 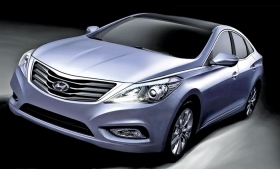 Sales begin in January, and Hyundai has said the new Azera has the potential to sell 18,000 to 20,000 units annually in the United States, compared with the 3,051 units sold last year. Michael O'Brien, Hyundai Motor America vice president of product and corporate planning, said there will be approximately 500,000 Sonata owners by the time the redesigned Azera hits showrooms. "We have never had that," he said. "We sold 196,000 last year. By the time we get to the launch, we will have another 200,000 out there, so that is 400,000, plus the old generations that are out there -- well over 500,000." O'Brien, who was interviewed at the Chicago Auto Show, said some Sonata owners "will want something better than they had before," which will lead them to the Azera. Pricing has not been announced. Prices for the 2011 model range from $26,270 to $30,850, including shipping. Hyundai also expects the new Azera to attract premium-car buyers in the Snow Belt, something the rear-drive Genesis sedan has failed to do.